PICK UP TIME // Suggested 7:30 am so that we will beat the traffic out of the city and we will back right on time before the traffic gets back in (it is flexible then you decide whenever during the day). 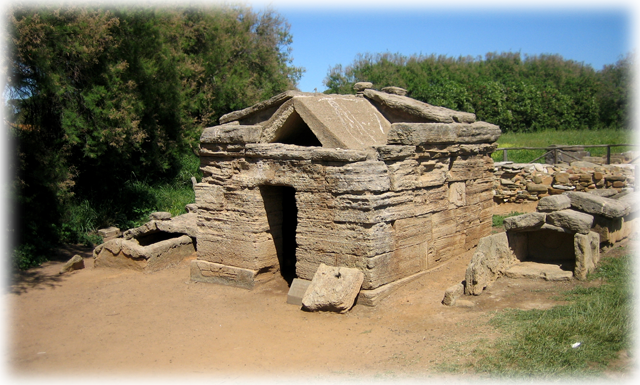 TARQUINIA ETRUSCAN NECROPOLIS // After around 1 hour and 30 minute drive you will reach the site of the Etruscan tombs! Just looks like an olive tree field but be careful because shaded by these centenary plants you will spot the entrances to these archaeological jewelry. TIME FOR LUNCH // Again this would be something you will never find on your own. A spotless trattoria in the middle of no where that most likely will open just for us! Just give it a chance. TUSCANIA // After lunch incredible but real the day will not be finished. Just a little further north is another unique town of Etruscan Origin where you will go to experience its quietness and wonderful view. CHURCH OF SAINT PETER // Not the most famous one, but a little non consecrated church in the middle of the Etruscan countryside. You will not believe your eyes. Even Romeo and Juliet by Zeffirelli was filmed in it. You’ll be surely impressed.